This past Friday bright sunny skies greeted us for a kick off to Earth Day celebrated with the Natural Resources Council of Maine (NRCM). The star of the event? An array of more than 50 solar photovoltaic panels which are providing most of the electricity at NRCM’s Augusta headquarters. 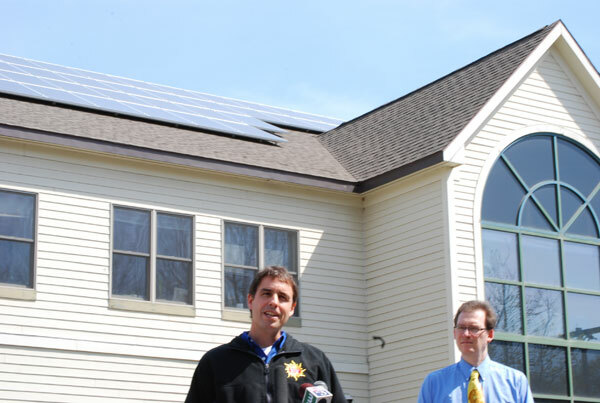 The event kickoff was followed by a reception attended by more than 30 homeowners and NRCM supporters interested in learning more about NRCM’s efforts to invest in renewable energy and the efficacy of solar in Maine. Phil Coupe of ReVision and Dylan Voorhees of NRCM took questions and talked about grassroots efforts to end Maine’s fossil fuel dependency. Thanks again for everyone who came out, and the great people at NRCM whose continued diligence makes Maine a better place to work, play and breathe!